It is no longer a luxury to have your windows and guttering professionally cleaned, particularly when the builders have left them in such a state! AB Cleaners London window cleaning services will remove all the dust and grime left behind, restoring them to pristine condition. 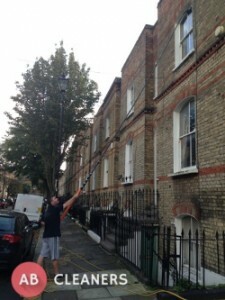 Our experienced and skilled team will come to your premises at a time that suits you. We’ll come on a regular basis; if that’s what you need, or give your windows a one-off thorough clean, taking away all the paint spatters and remnants of putty once the building work is complete. We’ll use environmentally friendly cleaning products, with non-toxic chemicals. Our qualified technicians will have modern equipment which enables them to get the best possible cleaning results. It’s important to remove all building debris left behind from the guttering, as overflows mark the walls and spoil the look of the house. We’ve the tools and the know-how to get the job done! Our team are fully insured so whilst they’re on your property, you’re completely covered. Call our friendly customer service advisers on 020 3404 1927. Request a free, no-obligation quote, or arrange for one of our team to visit you and give a free evaluation. Our lines are open 24 hours a day, 7 days a week and there’s always somebody there to help you. Don’t forget to ask about our multiple service bookings! Remember that you can fill in all your details on our contact form and we’ll get back to you as soon as possible. Alternatively, you can use our website’s chat facility, to ask one of our experts any questions you might have, and get a speedy response.